Each year, Helping Hands Hawaii/Ready to Learn (RTL) partners with social service agencies across Hawaii and generous donors from the community to help prepare thousands of local children (Grades K-12) for the upcoming school year. With the school year coming up quickly for many kids here in Hawaii, our team was excited at the opportunity to help ensure each child begins this school year prepared and equipped with the necessary supplies needed to assist them in their learning. 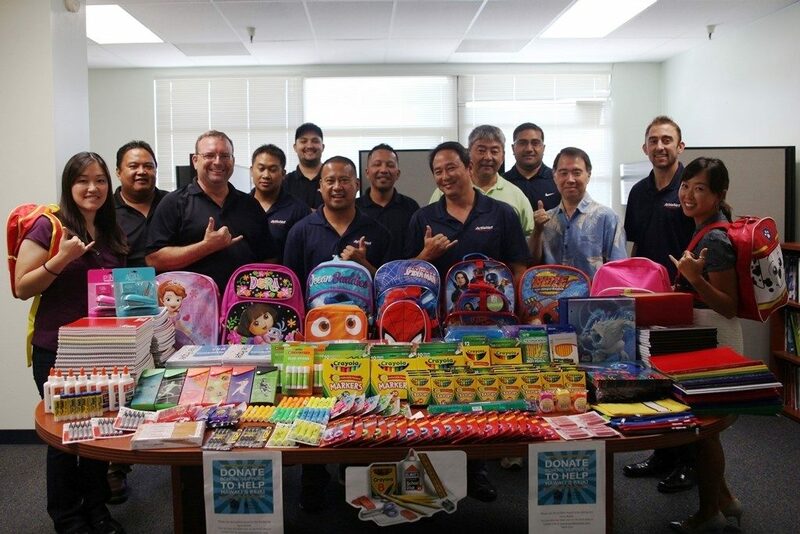 ActioNeters L to R: Kerry Y., Rey P., Alan W., Elmer O., Dennis I., Richard G., Joel R., Craig K., Burt Y., Pati M., Gerald G., Matt S., Sue J.
ActioNet Hawaii team members across the island provided various school supplies including backpacks, folders, spiral notebooks, pens, pencils, crayons, glue, lunch boxes, and much more! In 1999, the late Senator Daniel and Maggie Inouye initiated the RTL program in collaboration with Helping Hands Hawai’i. The program has become very successful over the years, and in 2005 Helping Hands Hawai’i took over statewide administration of this initiative. With the support of many donors in the community, the program helps over 7,000 students statewide each year. Helping Hands Hawaii and RTL continues to collect supplies year around to ensure that children of Hawaii do not run out of the basic supplies that they will need throughout their school year. Individuals, groups or businesses can organize a School Supply Drive to help support RTL. For more information and for help getting started, please call (808) 440-3857 or email rtl@helpinghandshawaii.org.